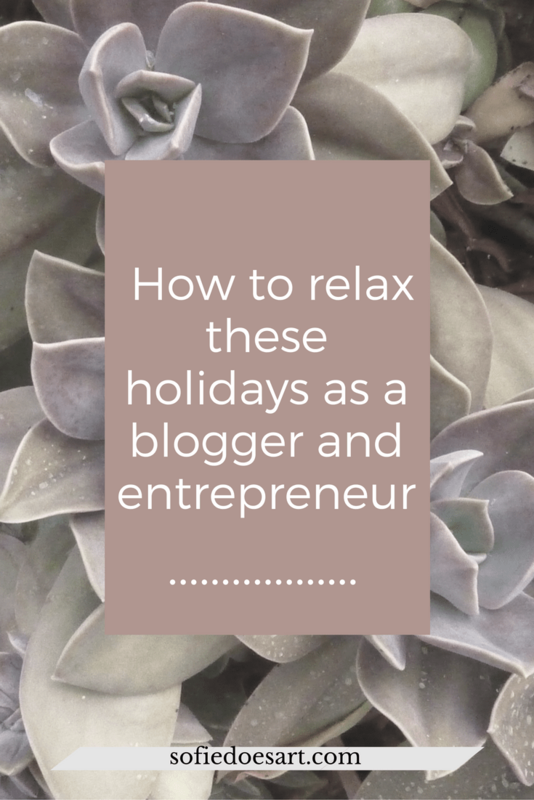 How to relax these holidays as a blogger and entrepreneur! Everybody deserves a break these holidays. But to actually relax and take a break can be hard. So how will you prepare and have a good relaxing break these holidays? Imagine this; It is the last day before my break and instead of working on said break I’m running around stressing because I still need to make sure everything is done for the holidays. Not the most relaxed ways to start a break. But when I am finally finished I want to have the most relaxing break I could possibly have. I have a whole bucket list of things I want to do! These will be great to relax a little and I hope you can too with the help of this list. Make sure you have some posts ready to go out or schedule your social media in advance. This is not necessary but it can give you peace of mind when you still have new content coming out. One of the most important things for me is going to be to let my emails rest. Now I do get all my emails on my phone so I will still see them come in and of course, I will still reply to the most important ones. But letting all the social media reports and so rest might actually help me catch a break. You know what is not relaxing. Seeing your stats drop because you are relaxing. So instead of checking them I’m going to try to not look at them for the full two weeks. After that, I will simply go and begin again from there. A small dip in stats will not mean the end for your blog or business. You will simply pick them up again after your holiday! Nothing is more relaxing than a warm belly full of deliciousness. These holidays I am planning on drinking a lot of hot chocolate and coffee. I think this is also the perfect little break for those who not choose to take more time off. Just taking the time for a holiday treat can make a good break in a busy working day at home. I am in love with Lush and Christmas is a wonderful time for those who love Lush. So one of the things I am going to do is take a lot of very very warm baths. My favourite bath bomb is “cinders” which is also described as the bath bomb which stands for warmth! Another thing I am looking forward too is all the family dinners and good food. I eat with my family every evening, but somehow holiday dinners are even better. I love the sense of relaxing when we cook in the evening and we have all the time. Also, I love all the visits and such. Over the holidays I get to seen so much more of my friends and family. I sometimes forget to take care of me in all the confusion and this break I will actually make sure I will have one pamper evening. With a bath filled with bubbles, tea and some fruit. Good food and a clear up will be amazing for your energy levels. Pamper evening are a great way to make sure your get in your self-care so you can end your holiday refreshed and re-energized. Another great way to get energised is by getting your exercise in. For some of us, this really can get pushed back in everyday life. So why not walk off Christmas dinner? I’m thinking a nice long hike somewhere. I love forest walks or long beach walks and I think the fresh air will really inspire me. Also, I’m taking my camera since shooting photos in the wild isn’t entirely the same as not work but pleasure. Doing some exercise this holiday and mixing it up will really help you feel fresh for when you go back to work. I can’t wait for my break to start, but mostly I can’t wait to come back full with energy and inspiration. I hope you consider taking a break these holidays and if you do let me know what you will do. What is your plan for relaxing these holidays? How to make your newsletter beautiful and readable! Blog photo prop must-haves for every kind of blog!